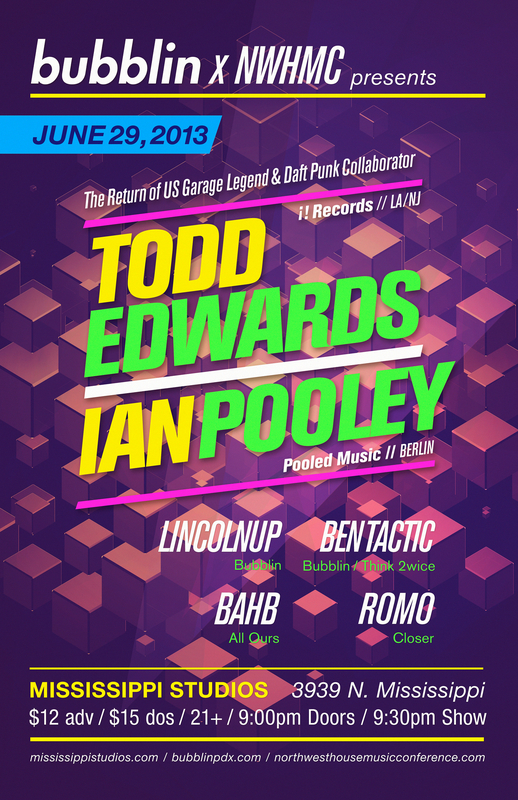 Todd Edwards made his PDX debut last November at (the sorely missed) Groove Suite, where he played a euphoric 4.5 hour set, sang ‘Face to Face’ live for the first time ever, and had the club levitating the whole while. Since then he has collaborated again with Daft Punk on their new LP ‘Random Access Memories’, was featured in DP’s The Collaborators series (alongside NIle Rodgers, Giorgio Moroder, and Pharrell), done an Essential Mix for BBC Radio 1, and played choice club and festival dates worldwide. TE’s patented style of hypnotically collaged/cut-up samples over swung beats and lively disco-flavored basslines has influenced seminal artists from Daft Punk to Burial to Joy Orbison and beyond. Credited as one of the godfathers of UK garage, his pioneering flavor long ago earned him a passionate following in Europe. In addition to his own legendary productions, Edwards has also remixed Justice, Phoenix, Klaxons, Hot Chip, Spank Rock, Boris, Appaloosa, Surkin, Robin S, Zoot Woman, St. Germain, and Dimitri From Paris. Edwards also co-produced, co-wrote, and sang on the Daft Punk song ‘Face to Face’ on their 2001 album Discovery. With an immense discography that stretches back to 1993, Ian Pooley is one of Germany’s first generation of DJ’s and Producers. But instead of following the distinctly Teutonic sounds emanating from Berlin or Frankfurt, Pooley fell in love with the grooves of Chicago and Detroit. Along with DJ Tonka, Pooley pushed a sound that explored the spaces between house and techno and, as a solo artist, found enormous success – eventually leading to a major label deal with V2 that yielded classic House albums like ‘Meridian’ and ‘Since Then’. Still as vital as ever, recently he’s released a great new LP, ‘What I Do’, on his own label, Pooled Music, and stellar singles for labels the likes of Innervisions, Ovum, and Lazy Days. This entry was posted on June 11, 2013 at 10:14 am and is filed under Bahb, Ben Tactic, Bubblin, Ian Pooley, Mississippi Studios, Mr. Romo, North West House Music Conference, Todd Edwards. You can follow any responses to this entry through the RSS 2.0 feed. You can leave a response, or trackback from your own site.